Wheat Ridge Evangelical Lutheran Church is a family of believers united in Christ. Our mission is to show Him to others, to ease one another’s burdens and to glorify God in all we do. Welcome to Wheat Ridge Lutheran Church. We are happy to have you visit our website. 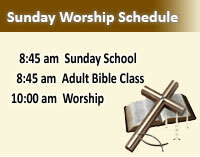 We invite you to our worship services on Sunday mornings, Sunday School and Adult Bible classes at 8:45 am and Worship at 10:00 am. Now as you browse through our website we hope you know that you are among friends. The purpose of our congregation is to share the Gospel of Jesus Christ. For God so loved the world that he gave his only begotten Son, that whoever believes in him shall not perish but have eternal life. Click below to find more about our ministry – opportunities for you to get involved.